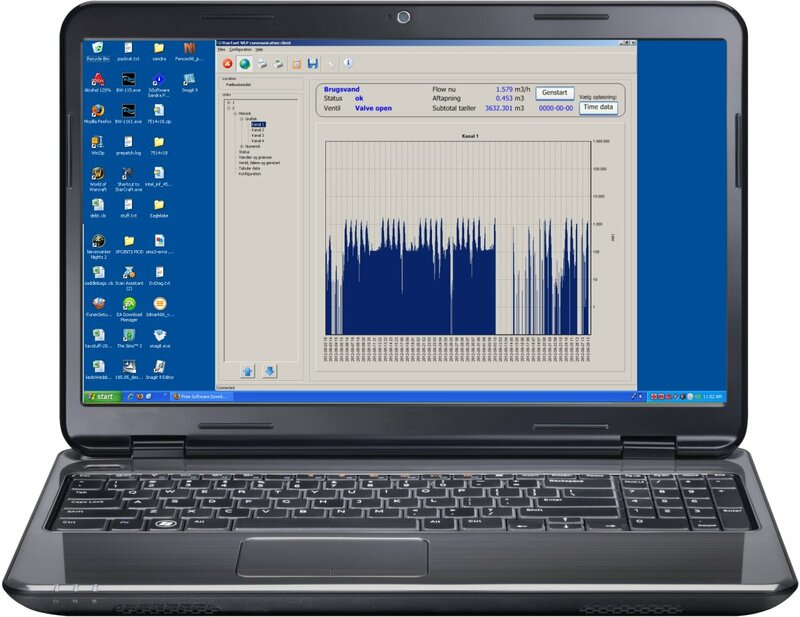 WM is a PC program for manual monitoring of supply water installations in buildings having a WLP-1 protection or monitoring system. The WM program features a Menu Bar, a narrow Navigation Field to the left, and a wide Presentation Field to the right. A phonebook in the Navigation Field holds the list of possible callouts. Dialling is done by pressing a button after selection of a building. Actual activity is displayed while connecting. Once connected, symbols for accessible systems are displayed. The same systems are shown in the Navigation Field, from where a menu may be opened for WLP-1 systems choosing what data to display. Once a certain data display has been selected, WM fetches current data for this; these are presented as they are fetched. When consumption data is chosen for display, WM fetches and stores these from the WLP-1, which holds a 14-day buffer for each measuring channel. WM may present this data via graphs or tabulation, with time resolutions of 5 min, 1 hr, 1 day, 1 month or 1 year. With dialups of sufficient frequency and duration, WM may thus maintain a complete consumption database on the PC's hard drive. WM fetches most recent data first, working backwards in time. Graphic display of consumption is a histogram with linear time axis and logarithmic ordinal axis. Each histogram column represents a measuring time (resolution) which is selectable by pushbutton, the column height representing the consumption within the given interval. Using the mouse, one may zoom in on a region and scroll backward/forward in time within available data. This display eases the identification of usual consumption patterns as well as deviations herefrom. The logarithmic presentation emphasizes wastage in the shape of perpetual background consumption. Thus system WM enables swift identification of e.g. running toilets in the water installation. Tabulations depict a timestamp for each measurement and the consumption (liters) in the interval. As with Graphs, the length of the interval is selectable 5 min, 1 hr, 1 day, 1 month or 1 year. Tabulation is used for exact consumption readings, and for data export. The Status display gives alarm status, instantaneous values for flow and discharge, total- and subtotal counters and reading date. Values and Limits display actual measurements and corresponding alarm limits for the various WLP-1 monitors. Valve, Sensors and Restart display valve position and status of attached wet sensors. Further, the display features a button for restarting the system from alarm state. Tabular Data displays a tabulation of system ID, measurement and limit values for documentation purposes. Configuration displays system ID, monitor and network configurations. Pressing this button will terminate the program, unless a dialout connection is established. Pressing this button connects to the system under the phonebook cursor, or an established link is disconnected. Pressing this button outputs the actual display to a printer. Pressing this button outputs the current screen to a printer. Pressing this button copies the current screen to the clipboard. Pressing this button saves tabular data to a diskfile. Text, Excel, HTML, XML and PDF formats are available.